I awoke this morning to faint celebratory screams of delight from parents around the neighborhood. Today for many, is the first day back to school. Although some kiddos out there may lack some of their parent’s enthusiasm, there is something wonderful about new backpacks, freshly sharpened pencils, and a bright outlook on fresh beginnings. Fresh beginnings. While many have this outlook on New Year’s, I think back to school is the perfect time to revamp your resolutions or even make new ones. You’re adjusting to a different schedule and having to getting reoriented and reorganized. Perfect time to start some healthy habits I’d say! Not sure where to start? Start with family dinner. 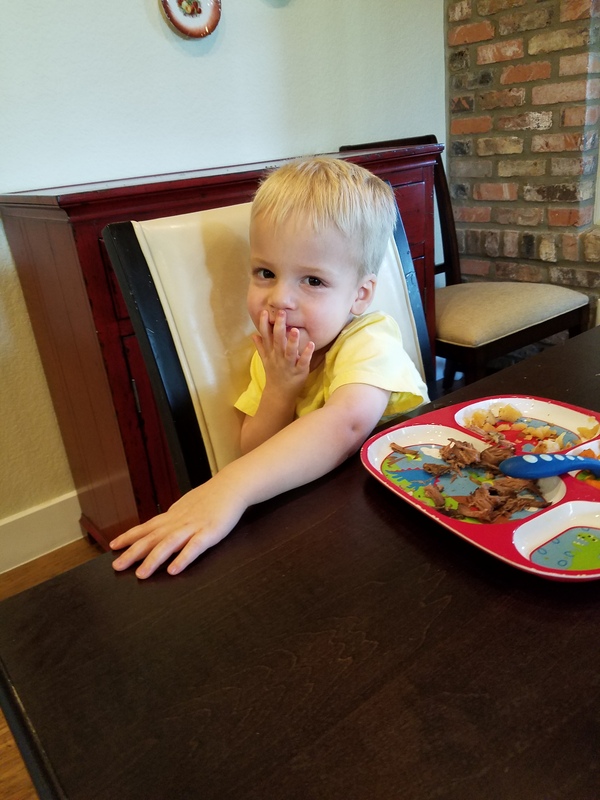 If you have kids, you might get a bit dizzy when you flash back to past hectic schedules and those demanding ravenous mouths who will wreak havoc until they are appeased. I can’t say all nights will be smooth sailing and your cup of tea, BUT you can help yourself out with some easy and nutritious meals you can plop at the table with and unwind. 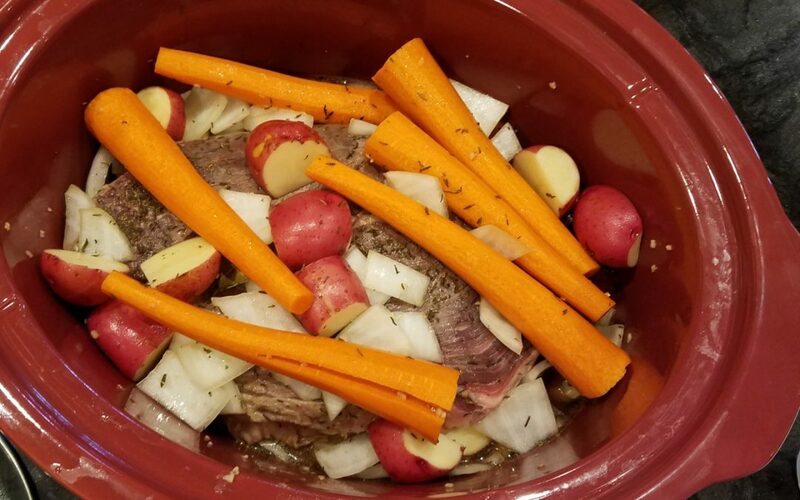 One such recipe is pot roast in the crock pot. By setting aside about 15-20 minutes in the morning you can prep it all, throw it in the pot, turn it on low and let the rest take care of itself. Best of all, when you come home, all you have to worry about is keeping its heavenly aroma from making you drool everywhere until you can get it on a plate. This is how I prepare roast at home, and it is a hit every time. No bouillon cubes, no store-bought seasoning packets with questionable ingredients. If you’re wondering what type of roast to get, know that sirloin beef roasts or round roasts are among the leanest. I actually used a shoulder roast the other night because it was in our freezer, and it has a little higher fat content. I really like this to see how they all compare. You can use beef broth or red wine in this recipe to really get the juices flowing. I used beef broth the other night, but looking back on my week, I probably should have gone for the wine…. Frantically thrown together with a toddler hanging on my leg. As long as it all makes it in the pot, it tastes amazing 8 hours later! Heat 1 tablespoon olive oil in a large pan over medium heat. Meanwhile, lightly sprinkle roast with salt and pepper on each side. Brown each side of roast in pan, transfer to crock pot. Return pan to heat. Carefully pour beef broth or red wine into pan, gently scraping the bottom with a spatula to mix all that beefy goodness left behind. Heat for about 2 minutes. Pour pan mixture into crock pot, over browned roast. Layer carrots, onions, potatoes, and garlic over the top. Add thyme, bay leaves, and a little more salt and pepper if desired. Cover crock pot and cook on low for about 8-10 hours. Let that amazing smell hit your face when you walk in the door and enjoy! Turn the TV off, put on some music, and enjoy this meal over some good ol’ family conversation. There’s usually lots to talk about in the first days of back to school! 🙂 Let me know how it turns out for you.